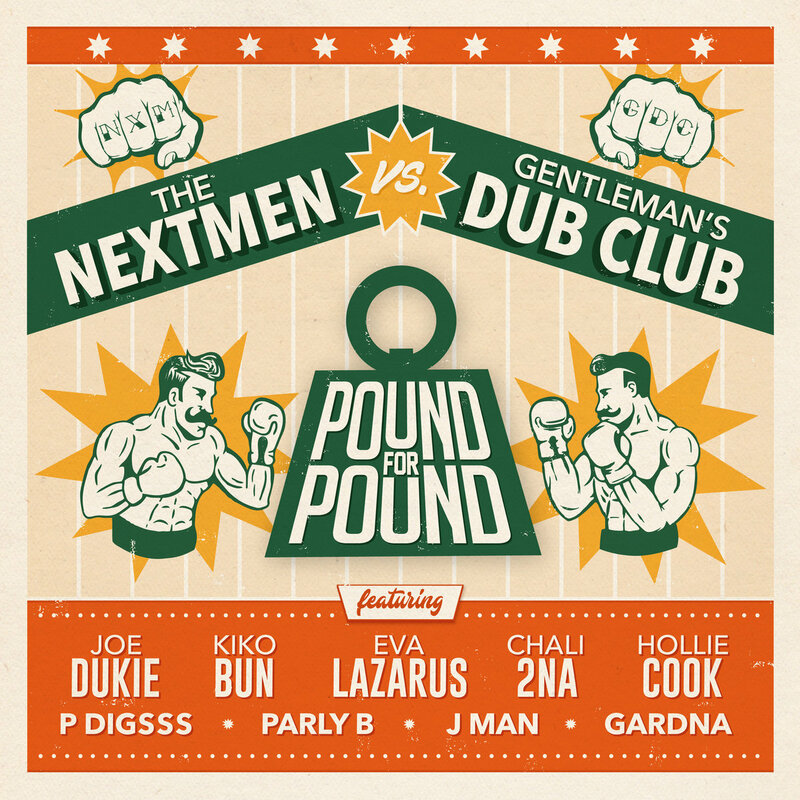 Dropping like a giant sunshine bomb on June 22nd 2018 was ‘Pound for Pound,’ a 12 track collaboration album between the exceptional production and DJ duo The Nextmen, and the huge UK reggae dub band Gentlemans Dub Club. As if that wasn’t enough to get you hyped already, these heavyweights are joined by a football teams worth of all-star vocalists who bless the album with track after track of infectious lyrics and sun-kissed hooks. The album kicks off with possibly my favourite tune on it, ‘Highs and Lows,’ a superb slice of soulful reggae featuring Joe Dukie of New Zealand’s Fat Freddys Drop. Bursting with love, positivity and thanks its a real gem of a track. ‘Spooky’ featuring Hollie Cook follows it with a dreamy, upbeat tale of haunted love, featuring a hammond riff that seems to nod towards the Doctor Who theme. Its a nice shimmery track, and it further establishes the kind of ‘pop vocal meets soundsystem’ style seen throughout the album. 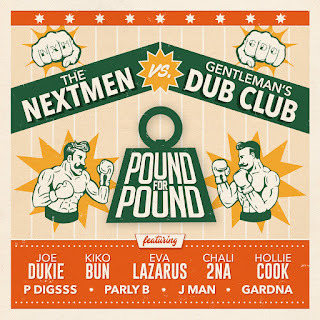 Track three, we get to ‘Rude Boy,’ the first single off the album, and a bit of a monster hit, featuring Gardna of the now infamous Boom Sound collective out of Bristol. Gardna features on no less than 4 tracks on the LP, and its clear to see Boom Sound’s involvement, with the album also featuring Eva Lazarus, Kiko Bun, Parly B, and Jman, all artists affiliated with Boom Sound for some time. Rude Boy is a huge anthemic ode to the joys of the dancehall life and it’s already been getting a lot of airplay across the BBC radio spectrum, with Radio 1, 6 Music and 1Xtra all playing it. You might be thinking ‘Radio 1?’ but do not fear, the track definitely bangs, with heavy bass, soaring horns and Gardna’s cheeky-chappy rudeboy tales that bubble and hype throughout. ‘See You Next Tuesday’ is the first of Kiko Bun’s three features, another track that’s been getting serious radio play as well, a breezy stepper of a tune about an ex, that is kind of, contagious, you might say. On ‘County Line’ and ‘Done it again’ Kiko and GDC’s front man Jonathan Scratchley delve into dabbling with danger and suffering the consequences of burning the candle and having a bit too much fun. ‘Holla my name’ features the unmistakable Charli 2na of the legendary hip-hop group Jurassic 5, and P Digsss from Shapeshifter, the New Zealand based DnB outfit. This is simply great, 2na-fish rapping wisdom on a mellow one-drop beat is a treat, and P Digsss sing-along chorus rings out, championing being there for one another at tough times in life. This is followed by a love song of sorts in ‘Misty Eyes’ feat. Eva Lazarus. Eva is an absolute powerhouse of an artist, it’s not that often you find people who can both rap and sing to a high standard, but Eva seems to effortlessly smash both whenever required. Evidenced by her contributions on this album, as she sings on ‘Misty Eyes,’ goes in heavy and sings the hook on ‘Running Scared,’ and does a bit of both again on the final track on the album ‘Pristine’ with Gardna. Speaking of ‘Running Scared’ this is the closest we get to a posse cut, with Eva, Gardna man and ‘the Yorkshire raggamuffin’ Parly B all letting rip on the mic. It’s also the most straight up dancehall stylee track, with some heavy staccato drum stabs and a more digital sound throughout. This album is a tour-de-force, providing a showcase of Reggae, Dub, Hip-Hop, Dancehall, Ska and Roots styles with super-sharp production. It’s the perfect soundtrack for this summer’s heat-wave, with sparkling summery hooks, and beats that will get any sound-system humming out. If you ain’t already, I highly recommend you go and check this one out. Featuring a vinyl release that was crowd-funded, showing that this one was eagerly anticipated, with strong demand from the DJs and enthusiasts out there.